As the most developed state in the country, New Jersey has to pay close attention to where and how development occurs. With limited amount of greenfield land left that is appropriate for development, redevelopment in existing communities with existing infrastructure is, of necessity, going to be the dominant form of growth. Recognizing this imperative, New Jersey adopted the first State Development and Redevelopment Plan in 1992 to help guide state and local decision-making to help the state continue to grow without jeopardizing its remaining natural resources. Revitalizing our urban areas through redevelopment, and enhancing our towns by preserving community character, design and historic features, and creating walkable spaces, a vibrant mix of uses and a range of housing options, will make New Jersey a truly sustainable state. Community design focuses on the building blocks of the built environment --- the buildings, roads, sidewalks, parking lots and public spaces – and relates them to each other and the natural environment: the streams, wetlands, lakes and hills. The state can play an important role in economic development by directing economic activities into places where infrastructure already exists, thereby minimizing the public subsidy necessary to support these activities and reducing the cost to businesses to build facilities, transport goods, connect with suppliers, customers and partners, and access employees. 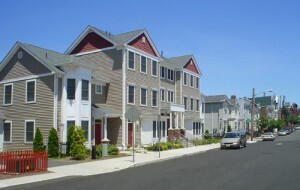 New Jersey’s current approach to housing has resulted in concentrated poverty in urban areas and reduced opportunities for families with modest incomes to live near where they work, since jobs have systematically been spreading across our suburban landscape instead of being focused in areas where public transportation exists or where we have already invested in infrastructure. Redevelopment is reinvestment in neighborhoods and commercial areas to replace or repair previously developed buildings or plots of land that are in substandard condition or are no longer useful in their current state. As part of our local work, New Jersey Future has partnered with the City of Trenton to advance and highlight the redevelopment around one of the city's natural and cultural assets, the Assunpink Creek in downtown Trenton. The number of New Jersey residents age 55 and older is rising. Many places in New Jersey that are home to large numbers of older people are not ready to accommodate their changing housing and mobility needs.